When we attended TyrOL OL-Festival in 2014, we had a rental car, but I did notice that the yellow (and sometimes white) postbuses went into even the most remote valley, and that several times a day, so I was wondering whether it was feasible to attend the OL-Festival purely using public transportation, without being too annoying, or missing out on too many things. In fact, it turned out to work very well, so this is definitely an option even for the future. It’ll work best if you have your accommodation in Steinach, which is very central in Wipptal, and sort of a traffic hub. 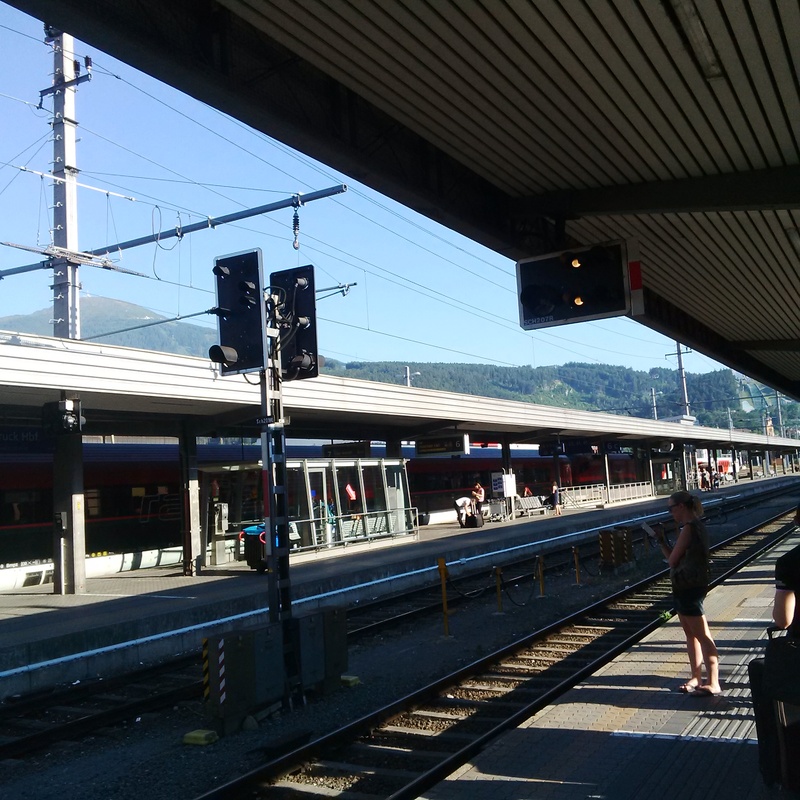 Even Matrei (one stop north on the commuter rail line) should work fine, and possibly even downtown Innsbruck if you stay in walking distance from the central station, though that would add about 2×20 minutes to every trip. In the following descriptions, I will assume that you are staying within walking distance from the railway/bus station in Steinach. If you are staying in Matrei, take the commuter rail (lines S3 and S4 one stop south to Steinach, the buses will be synchronised with the arrival of the train). Same if you are staying in Innsbruck, then it’s two stops (and the ride is quite spectacular). I am listing some departure times for information, but please check actual times for your trip on vvt.at, the website of the regional public transportation authority before leaving. In general, if you are planning to use public transportation, it would be a good idea to do as the locals do and get up early and go to bed early, as most of the buses stop running at about 6 pm. Also, most shops and restaurants open early in the morning (e.g., the bakery in Steinach opens at 6:30 am, the ”Billa” supermarket at 7:15 am), but close fairly early (at least for us Swedes who are used to shops being ”always” open). One problem we had to solve was what to do with our kit during practice runs (we always brought our orienteering backpacks to have something to sit on, as well as to be able to bring a change of clothes). We solved this by locking one zippered compartment of our backpacks with a small suitcase padlock, as well as locking the backpacks together and around a tree or a sign pole with a cable bike lock; the keys were small and light enough to just take along on the run. Probably a bit too much caution for the Tyrolean countryside, but we preferred to be rather safe than sorry. Oh, and of course we didn’t bring any unnecessary valuables along for the practice runs. 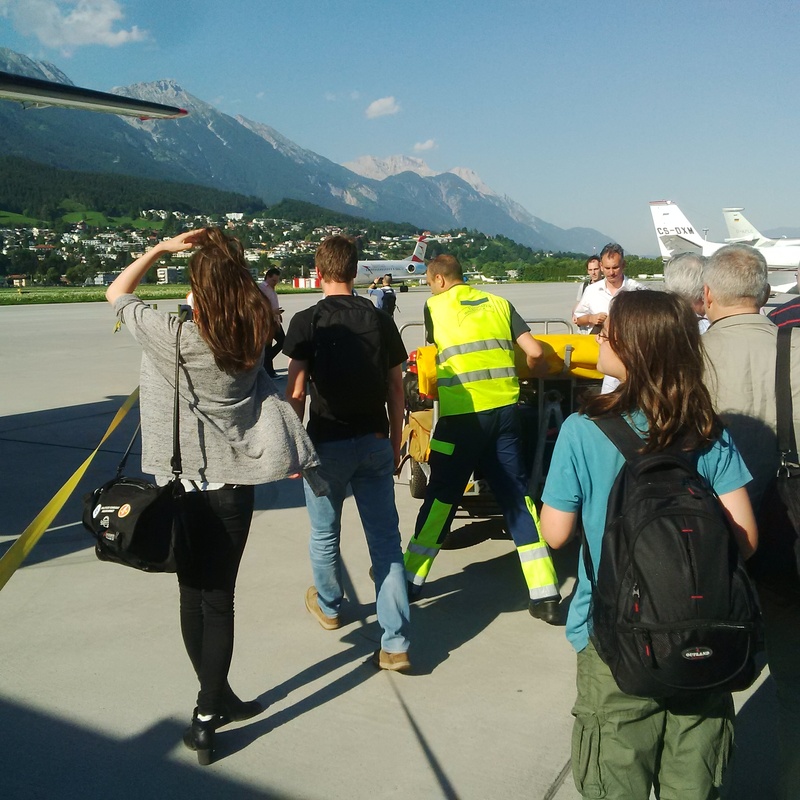 This year, we flew to Innsbruck Airport (which has several daily flights to/from Frankfurt and Vienna). A local bus (F, if I remember correctly, runs every 20 minutes) took us in about 15 minutes to the central station in Innsbruck from which commuter trains (S3 and S4 towards Steinach in Tirol or Brenner) take you in 20 minutes to Steinach (takes 20 minutes). 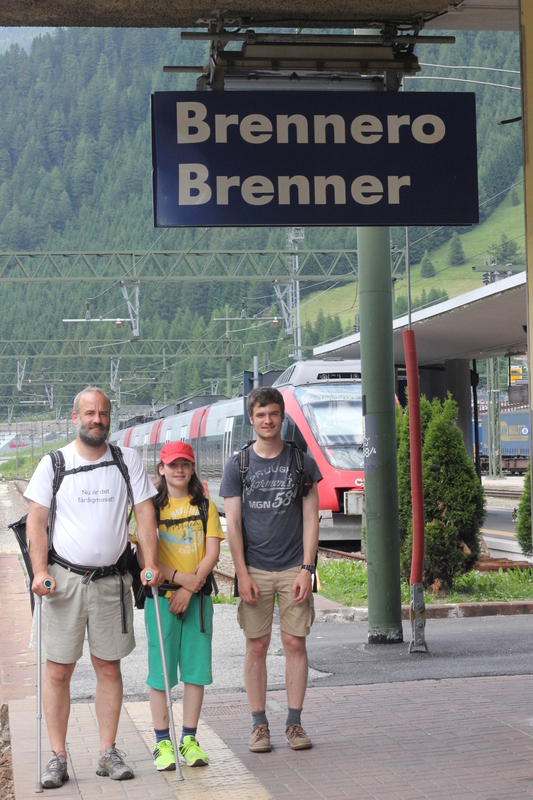 The year before, we flew to Munich and took a EuroCity train from Munich to Innsbruck, which takes a little less than two hours. Also worked well, but the transfer (by slow commuter rail, takes almost an hour) from the airport to the railway station is a bit annoying in Munich. There are two different maps at Obernberg, a forest sprint map near the Waldesruh restaurant, and an ordinary orienteering map up at the lake. In 2014, there were two trainings up at the lake and one down in the valley at Waldesruh; in 2015 there were also two trainings up at the lake, Waldesruh saw the first day race, a sprint. For either of the two maps, bus 4145 will take you in about 20 minutes from Steinach to Obernberg, Waldesruh, the last stop on the line. The bus stop is right by the restaurant and already on the sprint map. Getting up to the lake is a 20-30 hike steep uphill, but you would have to do the same if coming by car, as the parking lot is also at Waldesruh. Bus 4145 leaves once early in the morning, once at 9:18 am, and then about hourly from about noon to about 6 pm. The 9:18 am bus suited us fine, and we got the 17:15 bus back. Notice that for some departures you will have to change in the small village Vinanders, ask the driver. Summary: Absolutely no problem to reach the Obernberg maps by public transportation. The St. Magdalena map (which saw a training in 2014 and the middle distance race in 2015) is at the beginning (eastern end) of Gschnitz village. Bus 4146 will take you here from Steinach in about 20 minutes, ask the driver to drop you off at the ”Erhartlerhof” bus stop which puts you right on the map. Bus times are pretty much the same as for Obernberg. An interesting addition to a trip would be to continue on the same bus route to the final stop ”Gschnitz, Gasthof Feuerstein”, at the end of the road. You’ll find one of many restaurants here, but also a small and very lovingly built ”mill museum”, highly recommended, as well as the beginning of the (closed to most traffic) road to the mountain hut ”Lapones” (very nice beer garden and good food). It’s a 3km walk with quite some climb, but you can use an asphalted road all the time (useful e.g. if you have a pram with you; if not, I’d recommended to turn off to the smaller trail #50 after a while which will also take you to Lapones, but which is more scenic and exciting – for best views, use the small trail uphill and the road on the way back). Summary: Absolutely no problem to reach the Gschnitz map by public transportation. This was not part of the package in 2014, but there are permanent controls here (with a map in the form of a leaflet that can be collected at the tourist office in Steinach). In 2015, there was a training map here, with both the permanent and some additional controls. As this is in the outskirts of Steinach, it’s a mere question of a 20-25 walk from the railway station, past the Bergeralm ropeway. If you are reaching Steinach from the north by bus, it’s faster to get off the bus at ”Gasthof zur Rose” in which case you should have about 10-15 minutes left to walk. Summary: Absolutely no problem to reach the Gschnitztal Ost map by public transportation. Getting to Mieders is a bit of a hassle from Steinach, though, since it is in a different valley, Stubaital, than Steinach. Your best bet is to take the train to Innsbruck Central, then bus ”ST” to ”Mieders, Serlesbahnen”, the latter stop being right in front of the ropeway. This will take you about 75 minutes, and is possible about every 30 minutes. 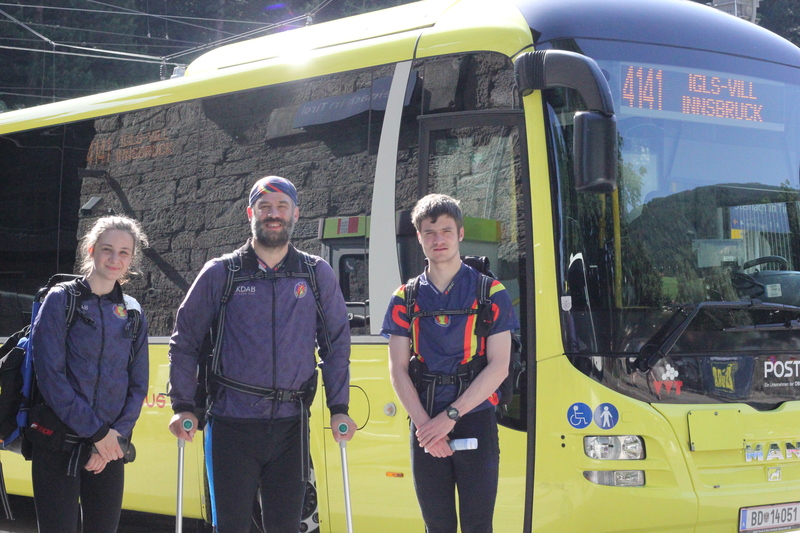 The staff at the tourist information office in Steinach told me, however, that in 2016 there will be a direct bus connecting the two valleys, so this should become easier in the future. In our case, since we had to be at the race early on a Sunday morning, we took a taxi from Steinach to Mieders. Another option to get to Koppeneck is to follow the instructions in the next section, and then walk for about one hour from Maria Waldrast to Koppeneck. Summary: Not as easy as the other maps, and expensive because of the ropeway (but you’d have that expense, too, if you had a car), but still perfectly doable unless you want to get started early in the morning. This is essentially the same map as the previous entry, but quite a bit further to the south. The middle distance race was held here in 2014, in 2015 there was a training map here (which we didn’t manage to run on, for lack of time, unfortunately). Again, this is terrain high up in the mountains, far away from public roads. There is a small and quite exciting road that leads up to Maria Waldrast from Matrei. It is not serviced by public buses, but a taxi company from Matrei runs twice daily scheduled services from the railway station in Matrei (4 minutes from Steinach on the railway line to Innsbruck) to Maria Waldrast, and of course metered services whenever you want. The scheduled service cost €5/person in 2015. Ask at the tourist information in Steinach for details. Summary: Not as easy as the other maps, and expensive because of the taxi (but there is a €5/vehicle road toll on the road to Maria Waldrast, too), but still perfectly doable. Bergisel is within the city limits of Innsbruck and thus should be the easiest to reach. However, it turned out to be surprisingly difficult. To begin with, tram #1 run by the city public transportation services in Innsbruck, will take you in about 15 minutes to Bergisel (that’s even the name of its terminus). However, it doesn’t stop at the central station, so you will either have to walk a couple 100m from the central station to the nearest stop of the tram, get another bus or tram to hit it (easiest likely to take the Stubaital tram towards Fulpmes, as it runs in parallel with tram #1 for a few stops, but also stops at the central station). Once tram #1 drops you off at its terminus Bergisel, you might be as confused as we were, since you are far from being on the map yet. You will need to walk uphill on the road to the right (east) of the terminus until it makes a sharp right turn, from here, a serpentine footpath will take you steep uphill to the touristy area of Bergisel, where the exhibitions and the main parking lot are. This also puts you at the corner of the Bergisel map, near to where the finish of the training courses in 2015 were (in 2014, we didn’t have time to run on this map, even though it was part of the package). There is also a tourist bus service which stops right by the exhibitions and thus map. It costs an extra fee though, and we didn’t use it. Summary: Given the location, harder to reach than you would think, but still very well doable. Easy if you are willing to spend the extra money on the tourist bus route. Technically, Igls is also part of Innsbruck, though it feels more like a village of its own. 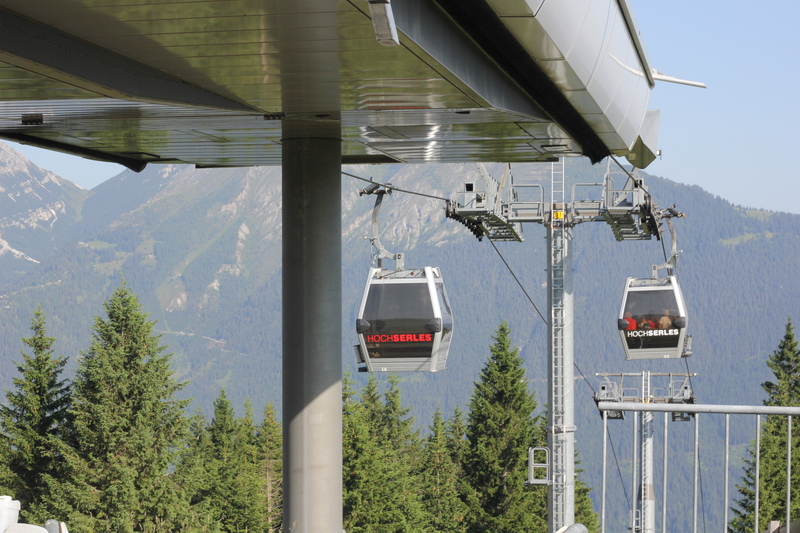 In 2014, the long distance race was held right at the valley station of the Patscherkofel ropeway. In 2015, there was a training map here, which had its start and finish near the parking lot of the Olympic bob course further up the hill. Since that was not reachable by public transportation, we went to the ropeway station again, which already put us on the map, walked a few 100m uphill, and then ran first the second half of the courses, connected finish to start, and ran the first half. Worked just fine this way, sometimes you need to be a bit flexible. 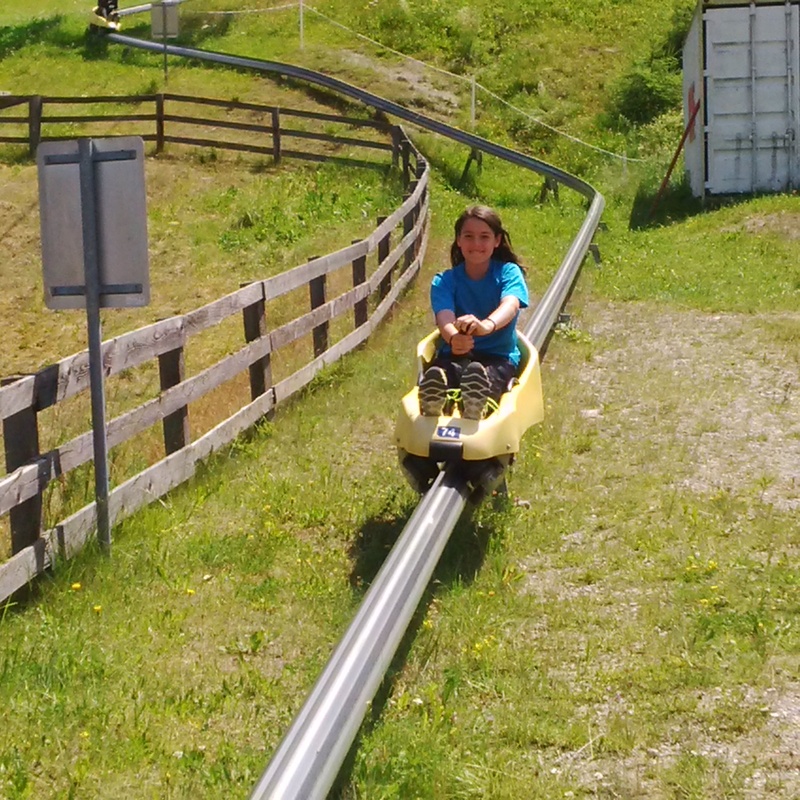 Igls is again very easy to reach from Steinach. Bus 4141 will take you there, and the departure times are again quite similar to Obernberg and Gschnitz. The road via Ellbögen to Igls is spectacular, and thus so is the bus ride. (If you are staying in Matrei, bus 4141 passes through Matrei and makes several stops there, no need to go to Steinach first.) The bus stop in Igls that is closest to the map is ”Altes Rathaus” from there it is a walk of about 10 minutes uphill to the Patscherkofel ropeway and thus the beginning of the map. You can also connect to a city bus either at ”Altes Rathaus” or to another regional bus in the village of Patsch (check the website for details), either of the two would drop you off right in front of the ropeway station at the stop ”Patscherkofelbahn”. Summary: The Igls map is again easy to reach by public transportation! While we spent most of our time orienteering, we did do a few more touristy things as well. Innsbruck with its old town and mountain railways is readily accessible by commuter rail, as previously mentioned. In the other direction, the Austrian-Italian border at Brenner with its shopping mall is reachable once every hour by commuter rail (and the ride is spectacular again). I have already mentioned the activities in Gschnitz. Steinach has the Bergeralm ropeway, walking distance from the village center. In terms of eating out, Steinach has enough restaurants within walking distance to keep you well-fed (but remember that they won’t be open until late at night, they usually close at 9 or 10 pm, some even earlier). Matrei, four minutes to the north by commuter rail, gives you more options, and of course Innsbruck has gazillions of dining options. And finally, the village of Gries on the Obernberg bus route has several nice dining options, but since the bus stops running at about 6 pm, that makes it a bit hard to avail of these. Besides saving some carbon dioxide, another design goal of using public transportation was to save some money. And it seems like we did. In 2014, the rental cost us about €380 for a week, plus a tank full of gas for about €80. 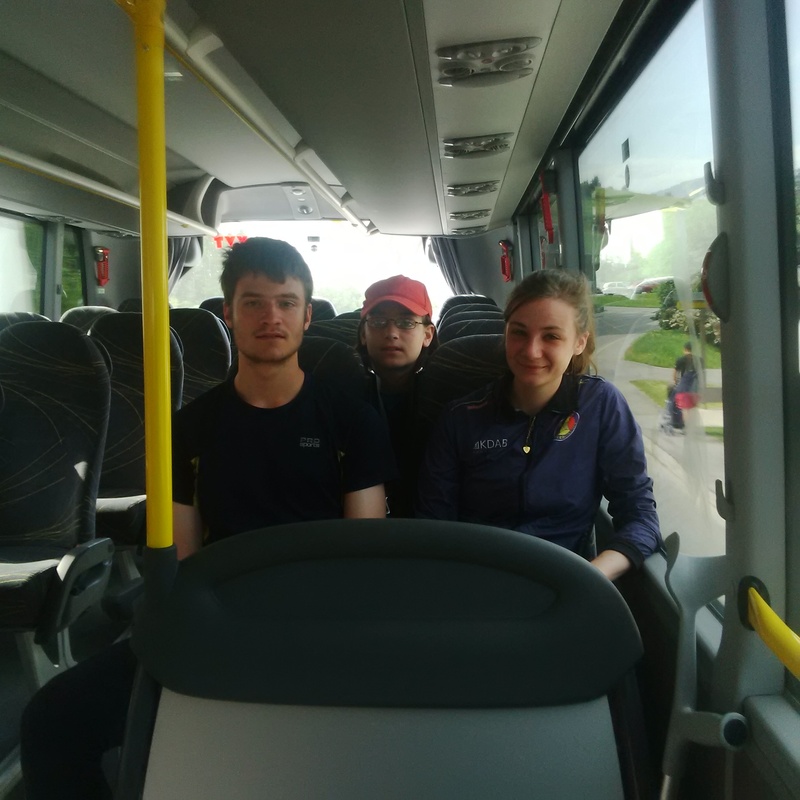 In 2015, we bought a so-called region ticket ”Wipptal/Stubai” which lets you use all buses and trains and trams in the area, including in downtown Innsbruck, which was available as a week pass for about €36 per person; thus for the four of us we spent €144 on those tickets (when you get them, make sure staff actually sells you a region ticket (it should say ”Region Wipptal/Stubai” on the ticket), and not some other ticket some covers parts of the area as they did with us first, was a bit of a hassle to get that exchanged). Notice that you cannot get the region ticket from the bus driver, you’ll have to buy it from a ticket outlet (there is one in the convenience store in the arrival hall of Innsbruck airport, if you come by train, you can get it from ticket sales in the central station). Even with some extra money for the odd taxi ride, we saved quite a bit of money. The downside was less flexibility, but we rarely felt that that was a problem. One thing you need to do, though, when using public transportation, and that is to plan ahead! Det här inlägget postades i Okategoriserade och har märkts med etiketterna allmänna kommunikationer, Gschnitz, Igls, Mieders, Obernberger See, OL-Festival Tirol, orienteering, orientering, public transportation, Serlesbahnen, Steinach. Bokmärk permalänken.